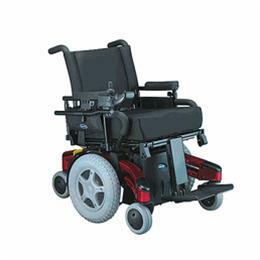 The TDX4 is the mid-range model of the TDX line of power wheelchairs coming standard with four of the Total Driving experience technologies - SureStep Suspension, MK5 electronics, Center Wheel Drive and Stability Lock. Stylish, powerful and flexible, the TDX4 brings much to the table and can have TrueTrack added if needed. This model is designed to meet the needs of many rehab consumers today and allows additional technologies to be adding as needed over time. SureStep suspension combined with TCD™ (Traction Control Design) provides for optimal maneuverability and traction in forward and in reverse on ramps and outdoors. Configured to maneuver over obstacles up to 3" in the forward direction and 1" in reverse. Overall Height: 33.25" - 41"
Overall Width: 24.5" - 28.5"